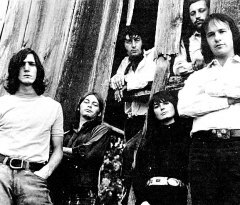 In the summer of 1970, right after the Festival Express tour had ended, Ian and Sylvia Tyson went into the studios of CFTO-TV in Toronto to tape the pilot for a new music series for Canadian network television. They brought their group Great Speckled Bird to the show to become the house band. The 30-minute show was produced by Gerry Rochon, and Michael Steele was the director. It went on the air as a weekly series on Monday, September 14, 1970 at 8:00 pm on Channel 9, Toronto, and Channel 13, Kitchener. This was prime time, the same time slot as Rowan and Martins Laugh-In, Green Acres and Medical Center. The show became a hit. The show was always taped live in front of a studio audience. During the first season the show was taped in real time, from start to finish and was aired that way. That first season the show was called Nashville North. That was designed to connect Toronto to Nashville and give viewers a connection to the format of the show. Apparently, this confused viewers to some degree. The hard-core country fans were disappointed with the show, and Ian and Sylvia fans didnt know they were on the show. But with the the fine production values, and the variety and quality of the music, the show connected with a wider demographic than was anticipated. The format was simple. It began every week with the theme song Long, Long Time To Get Old, a song written by Ian Tyson and recorded on the recent Great Speckled Bird LP on Ampex. Then Ian announced the guests on the show. The first segment was usually Ian, or Ian and Sylvia with Great Speckled Bird. Sylvia was only on about half the shows. Gerry Rochon, producer of the show said, Sylvia was dropped from the initial concept because if you have a co-host you get hamstrung with giving her song time and spots to introduce guests; this way Ian is the host and Sylvia does about half the shows as a guest. From there the show moved to the first guest star, then the second and third guest star. If a guest artist had no band, Great Speckled Bird backed them up. Then the final segment with Ian and the band, a message from Ian about the environmenta reminder to the viewers to take care of their world in some specific way. Then the band played the closing theme, another one of Ians songs called Some Kind of Fool. The credits ran over this tune, and that was a show. The production week went like this. Rehearsals began at the Holiday Inn at Agincourt on Monday, sometimes as early as Sunday, when Ian, Sylvia and the band would go over the tunes they were going to do that week. Then blocking began with the production staff on hand and every guest star running through their numbers for the show. This would go on through Wednesday. If any guest needed a band, Great Speckled Bird would have to learn their material. When all was ready, rehearsals for camera shots began in the CFTO studio on Thursday morning. This would go on all day with a break for lunch and a dress rehearsal in the afternoon. After a supper break everyone went to makeup. The studio audience would come in and take their seats. A warm-up act, usually a single performer, would sing for the crowd to get them in the mood. Then everyone went to their places for the start of the show and the taping would begin. Two shows would be taped on Thursday night and then the same thing again on Friday. Four shows would be in the can by weeks end. During the first season there were changes in Great Speckled Bird. Amos Garrett left the band then Buddy Cage. Amos was replaced by Toronto guitarist, David Wilcox. Buddy was replaced by Nashville steel player, Ben Keith. Before the regular season started Ian hired New York piano player, Jeff Gutcheon. Jeff would play piano on the show for the next two years. N. D. Smart remained on drums and Jim Colegrove remained as bass player. Great Speckled Bird stopped touring in the fall of 1970 and was used exclusively on the television show. The show, under the title Nashville Now, was syndicated in 32 markets in the United States during the first season, New York City among them. While the show featured guest stars from Nashville, there were always guest stars from Canada as well, due to Canadian content law. Ann Murray was riding high with her hit Snowbird and was featured on the show. In its second season the show was taped in segments and edited to the version that went to air. The name of the show was changed to The Ian Tyson Show. This gave it full identity as a Canadian show and removed all confusion about whose show it was. Michael Steele became producer/director. Toronto Sound engineer Peter Houston became a sound consultant. Its popularity grew. After the second season Ian decided to take Great Speckled Bird out to live venues once more. At that point the group went through another series of changes that brought to its ranks Pee Wee Charles on steel; Billy Mundi on drums; Red Shea on guitar; and Gord Fleming on piano. Through all these changes Jim Colegrove remained in the band on bass. The show continued to enjoy success in the ratings. 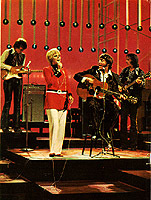 The guest stars featured virtually all the great country acts from Nashville at the time such as Ray Price, Porter Wagoner, Dolly Parton, Jeannie Pruitt, Jack Greene and Jeanne Sealy, Johnny Rodriguez, Carl Perkins, Loretta Lynn, Jim Ed Brown, Jeanne C. Riley, Merle Travis, Chet Atkins, Jerry Reed, Tanya Tucker, Conway Twitty, Bob Luman, Willie Nelson, Waylon Jennings, Kris Kristofferson. Other stars such as Gordon Lightfoot, The Stampeders, Mashmakan, Jack Elliott, Buffy St. Marie, John Prine, Lucille Starr, The Country Gentlemen, Mason Williams, Kenny Rogers, Seals and Crofts did the show, and so did Rompin Ronnie Hawkins. Linda Ronstadt appeared with a band that would soon become known worldwide as the Eagles. The Ian Tyson Show continued into the mid-1970s. Jim Colegrove left Great Speckled Bird in 1974 and was replaced by Roly Saley who would later turn up in Chris Isaaks band in the 1990s. By April 1975 the show went out of production. As far as can be determined there are no videos that were archived by CFTO. If there are any copies of the show they must be in private collections. Of course, there are surviving audio tracks of the show, especially by Ian, Sylvia and Great Speckled Bird. An example can be heard on the reissue of Great Speckled Bird on the Stony Plain CD (Stony Plain SPCD 1200). The cut, New Truckers Cafe, is a live performance from the early TV show. ©2015, The Cool Groove, All Rights Reserved.